Take a look at the map of the West Coast of the United States and you’ll note it is home to around 51 million people, living in vastly different cities and regions each with their own unique culture, history, landmarks, and environments. From San Diego to Seattle, the West Coast has many interesting and noteworthy cities. Let’s take a look at a map of the west coast and go over some of the coast’s most notable cities and landmarks. The city of San Diego can be found right on the border of the United States and Mexico. San Diego is the second largest city in the state of California, and also the eighth largest city in the country, home to approximately 1.4 million people. San Diego produces a substantial amount of produce for the country and the world, with avocados being one of San Diego’s primary exports. Many movies and TV shows are filmed in San Diego. Popular landmarks include the San Diego Zoo, the USS Midway Museum, the Mission Beach Boardwalk, Sea world, and the Spruce Street Footbridge. Whale watching off of San Diego’s coast is a popular activity. The Los Angeles metropolitan area includes the city of Los Angeles proper, Long Beach, and Anaheim. The combined metropolitan area ia home to around 13 1/2 million people. This makes the Los Angeles metropolitan area the 18th largest metropolitan area in the entire world. Los Angeles is home to Hollywood, where some of the most famous TV shows and movies are created. Los Angeles is steeped in large, diverse culture and history. The city is home to notable scientific and historical landmarks like the California Science Center and Griffith Observatory. It is also home to some of the world’s most popular theme parks including Disneyland and Universal Studios. Santa Monica Bay and Venice Beach are common stops for tourists, as is the Hollywood walk of stars. California’s Inland Empire contains the cities of Riverside, San Bernardino, and Ontario. Combined, the region has a population of approximately 4 million people. The Inland Empire is a substantial shipping and agricultural hub for California and the US as a whole. San Bernardino is a large county, bigger than the nation of Switzerland. The first McDonald’s was created in San Diego. The San Bernardino National Forest and the Rim of the World Highway offer scenic hikes and drives. Riverside is home to the March Field Air Museum as well as the California Museum of Photography. Ontario has the Planes of Fame Air Museum as one of its notable landmarks. Bakersfield is located at the southern end of the San Joaquin Valley. 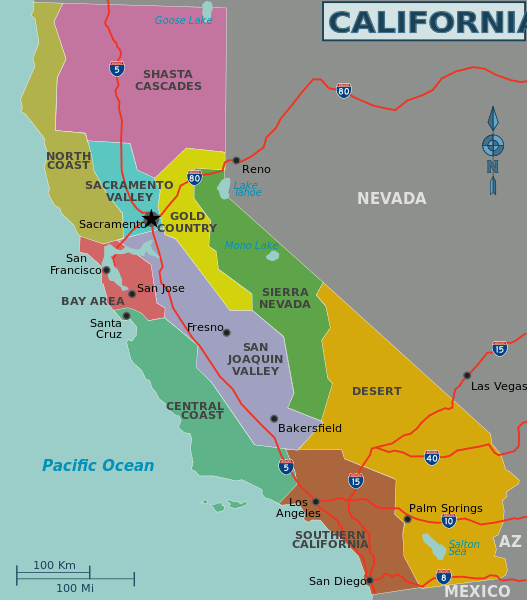 It has a population of approximately 375,000 people, and is the origin of the “Bakersfield sound”, a genre of country music. The Kern County Museum, the Buena Vista aquatic recreation area, and Buck Owens’ Crystal Palace are famous landmarks within the Bakersfield region. Located just slightly north of Bakersfield, in the middle of the San Joaquin Valley, is Fresno. Fresno has a population of around 500,000 people, and it’s one of the primary agricultural centers of the United States, exporting goods to cities across the world. Fresno has the distinction of being the largest inland city in California, and it is close to beautiful national parks like the Yosemite National Park and the Sequoia National Park. The Fresno Chaffee Zoo, the Forestiere Underground Gardens, and the Shinzen Japanese Gardens are notable attractions in the city. The San Francisco Bay area is comprised of three major cities, San Francisco, Oakland, and San Jose. The combined metropolitan area has a population of around 7.7 million people. San Francisco is known for its unique architecture, robust Asian American and LGBTQ communities, and famous landmarks like the Golden Gate Bridge and Alcatraz Island. Oakland is an industrial city which serves as a major port for the state of California and is home to the Chabot Space and Science Center as well as the Tribune Tower. San Jose is known as being the birthplace/capital of Silicon Valley and plays a major role in the tech industry with many hardware and software companies based out of the city. San Jose is also home to five different Chinatown’s, a Japantown, and the famous California Theatre. Sacramento has been the capital of the state of California since 1854. It is home to around 490,000 people, as well as famous landmarks like the Tower Bridge and Capital Park. The city of Sacramento is said to have more trees per capita than any other city in the world, giving it the nickname “the city of trees”. Sacramento has several museums, including the Crocker Art Museum and the California State Railroad Museum. River cruises are offered which take passengers down the Sacramento River. 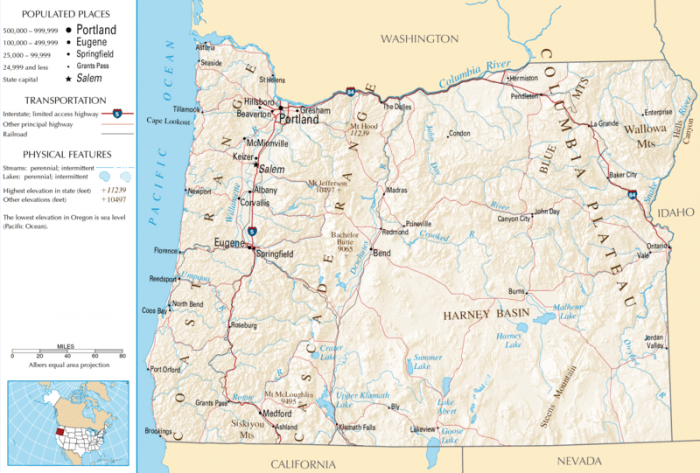 The Portland metropolitan area encompasses the city of Portland, Gresham, and Vancouver. The combined Portland metropolitan area is home to approximately 2 1/2 million people. The city of Portland is recognized for its environmentally conscious and friendly mission, as well as for its unique culture. The city’s unofficial slogan is “Keep Portland Weird”. The St. Johns Bridge, Tilikum Crossing, the Oregon Holocaust Museum, Pittock Mansion, and The Grotto are all notable places to visit in Portland. The Multnomah Falls and Mt. Hood can both be reached in a day’s trip from Portland. 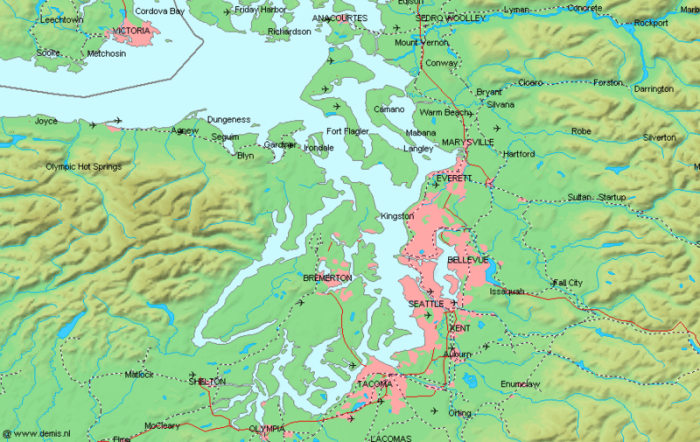 The Seattle metropolitan area is comprised of Seattle, Bellevue, and Tacoma. 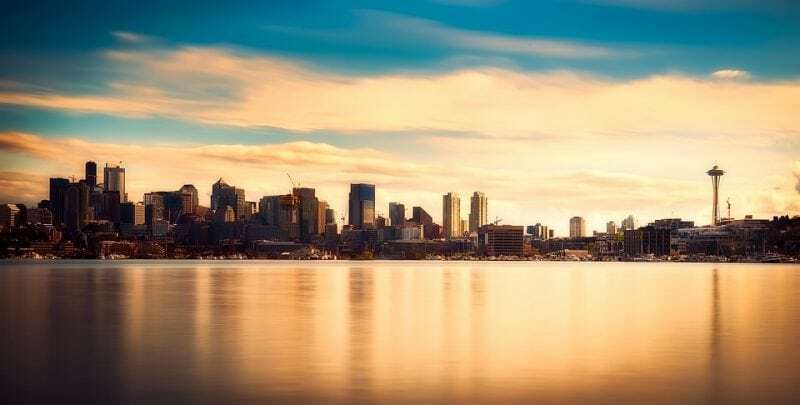 The metropolitan area is home to approximately 3.9 million people, and the region is frequently referred to as the Puget Sound region. Seattle is the birthplace of many famous companies like Boeing and Starbucks. The city functions as a major port for both shipping across the Pacific Ocean and for pleasure cruises. The nearby Mt. Rainier and Snoqualmie Falls are popular destinations for nature lovers. Famous landmarks include the Space Needle, the Chihuly Garden and Glass Museum, and the Pike Place Market. Ferries give tours throughout the city’s various waterways and throughout the Puget Sound.